The report also is linked to accusations that information about this remarkable find has been carefully covered up by major archaeological institutions and museums because they fail to fit within an established chronology of world history; especially the story outlined by the Christian Bible. The Smithsonian, however, denied that there ever was such a discovery and that several expeditions, actually searching for such an alleged cavern, proved fruitless. If such a treasure was found by anybody, it has been lost again. Like the legend of the lost Dutchman gold mine of Arizona, the cache of Egyptian gold and copper treasures remains a lost mystery, if it ever existed. We heard the story of the lost Dutchman mine from one such story teller while we spent a few weeks living in a run-down old (but very reasonable) motel just outside of Holbrook. There were a lot of drifters living there, and we spent a lot of our time gathering in one of the rooms turned into a coffee shop and community meeting place. The stories told at that table were so rich this writer found himself taking notes just to get them written down on paper. We heard about secret tunnels known only to the Navajo and Hopi people, where the people can flee in the event of a catastrophic event. After a long trip on winding and twisting roads across the open Navajo landscape, my wife was shown two giant doors mounted on the side of a large mesa, and was told that they were the entrance to this special underground vault. Then there was the story about a monster that lived in a deep pool of water, strangely located on the side of the Third Mesa on the Hopi Reservation. The people say the pool appears to have no bottom. And they say that at least one person, a young man who dared to swim in it, was seized by the creature and pulled into its depths, never to be seen again. We stood at the edge of this pool while the story was told to us by a Hopi two-horned priest. 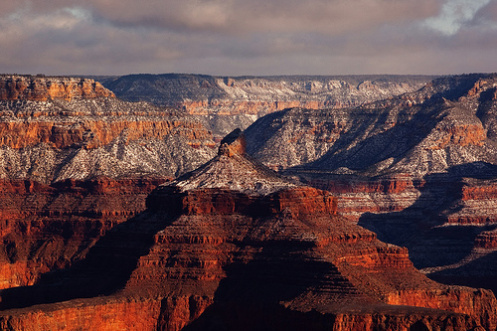 Some have called the Grand Canyon Egyptian treasure story a hoax. We would rather identify it with the strange mixture of local yarns that include the odd story of woodsman Travis Walton who got whisked away by a UFO while driving with friends in the forests near Snowflake, Arizona, in 1975. Walton got a lot of recognition for his story, which appeared as a novel and later the film Fire In the Sky. But this story, like all the other yarns to roll out of that colorful state, are mostly part of the mystique of the area. They are just that, great stories. There may be some truth to them, and maybe not.